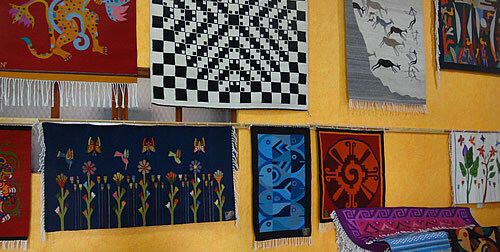 A fascinating demo of traditional textile dyeing and some beautiful stone fretwork and two atmospheric tombs at Mitla. 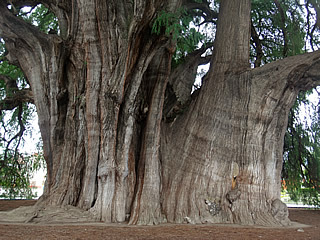 Plus an enormous ancient tree and a "frozen waterfall"! 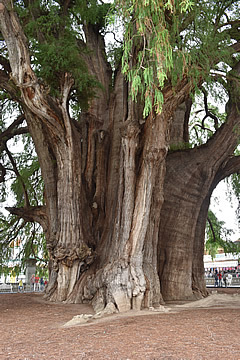 This enormous tree at the village of Santa Maria del Tule is a Mexican cypress said to be over 2000 years old - ring dating from a core sample dated it to 1 BC. 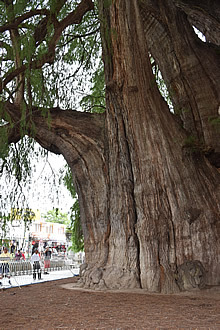 It has a diameter of over 14m! 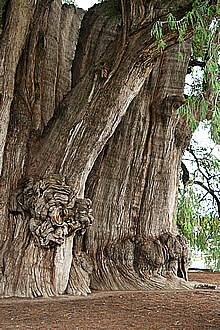 Nearby are 1000 year-old and 100 year-old specimens. The Spaniards tried to destroy it as the villagers regard it as sacred but they didn't succeed so built a church nearby instead. 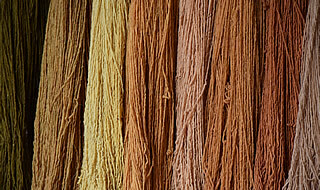 Materials from which natural dyes are made. 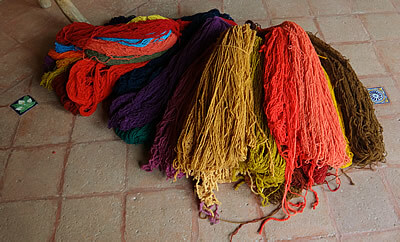 We had a really superb demonstration in a traditional weaving establishment of how the natural dyes are made. 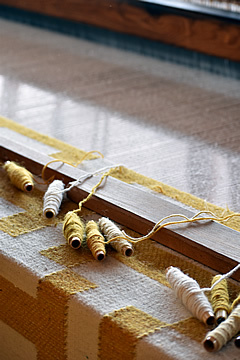 We have many times seen weaving in action but never before seen how the dyes are actually made. 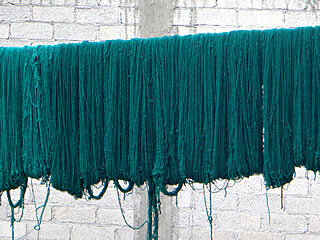 The chap gave a very good demonstration of carving and spinning of the wool, preparation of dyes and the dying process. 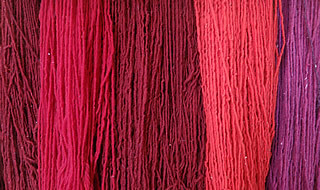 Cochineal insects look like grey grit but when crushed produce a carmine red. 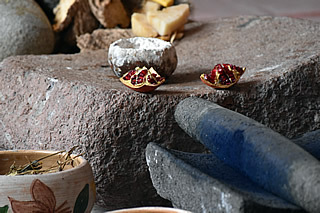 Carmine red colour comes from cochineal insects on the nopal cactus. 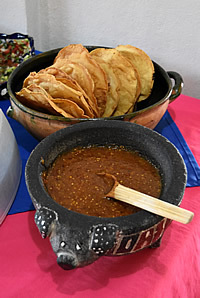 The red can be modified to a scarlet by adding acid (lime - the fruit) or to purple by adding alkali (lime - the mineral!). 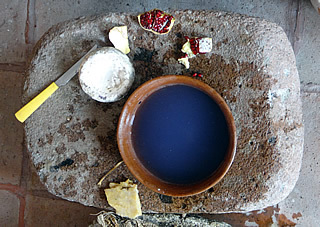 Pomegranate can produce dyes from yellow to deep blue, virtually black. From deep red to scarlet by adding lime juice. 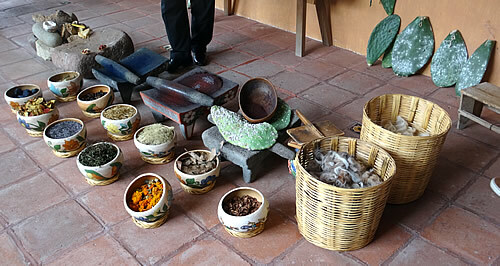 We also visited a mezcal producer. I don't like the stuff, far too smoky for me. 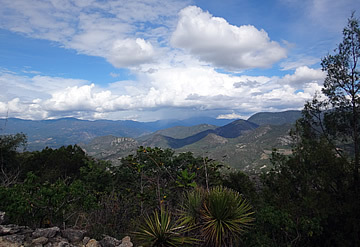 There were very generous tastings of various mezcals and much more precious "wild" mezcals. 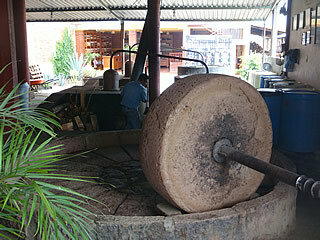 Traditional crusher with distillation apparatus behind. 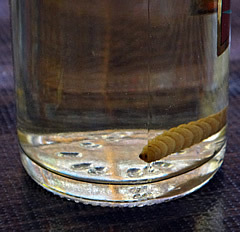 Some mezcals contain a "worm" - actually an insect larva. 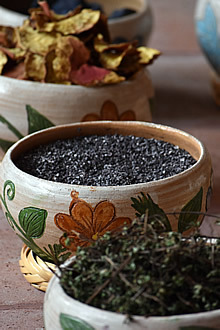 Mezcal is made from the agave plant - not just the blue agave from which tequila is made. 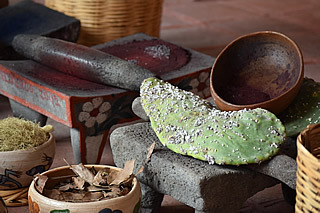 The agave plant is stripped of its leaves and roasted, traditionally in pits covered with the leaves and soil. Finally it is fermented in vats of hot water and distilled. 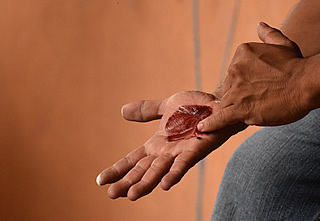 Contrary to popular belief, tequila does not traditionally have a worm in the bottle, only some mezcals do, though this is a modern invention, probably a marketing ploy. 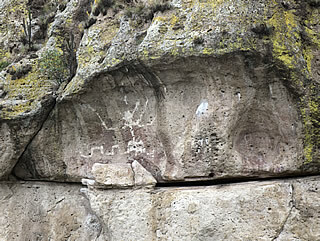 Prehistoric rock art in Yagul. 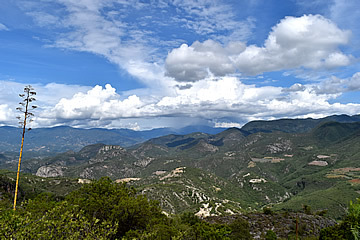 On the way to Mitla we passed the area of the prehistoric caves of Yagul and Mitla where evidence of plant domestication going back 10,000 years and habitation by hunter-gatherers has been found.1 Some rock art was visible from the road. 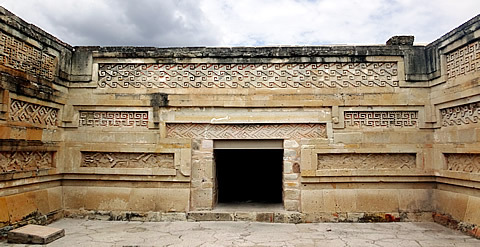 Like many of these ancient cities, people probably lived on the site for centuries before the Zapotec came to prominence, and Mitla was still inhabited at the time of the conquest. The walls of the buildings lean outwards. 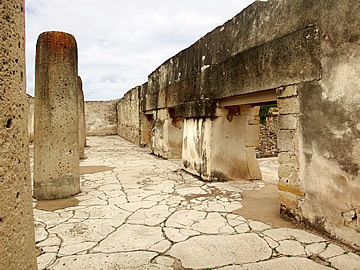 The Group of the Columns is the most impressive of the remains of pre-colonial Mitla. Here stone-built halls raised on platforms surround two spacious courtyards, north and south. 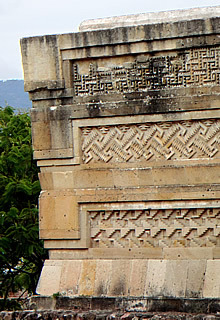 The stand-out features of the architecture are the beautiful stone fretwork friezes on the walls. 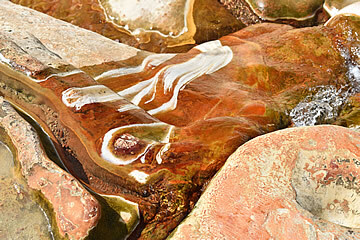 Colour was used extensively - particularly red. Palace of the Columns on the north side of the northern courtyard. 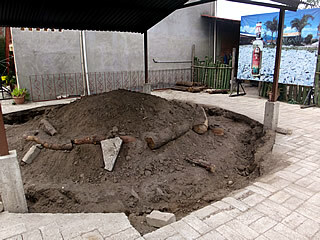 This courtyard had an altar at its centre. The Palace of the Columns on the north side of the north courtyard is in a good state. 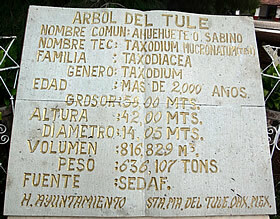 Buildings on the other side were dismantled by the Spanish to provide building stone for their own projects. Fortunately the Palace of the Columns remains virtually intact. The six columns and wooden cross-beams would once have supported a flat roof. The room is thought to have been used for civic administration. 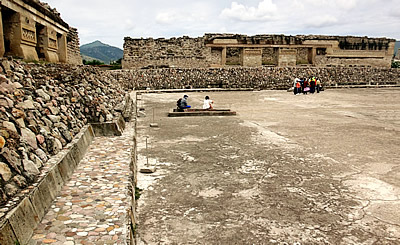 The monumental steps lead from the courtyard to three entrances to the palace and within is the Hall of the Columns. The stone for the six columns and the massive door lintels was quarried from the surrounding hills. 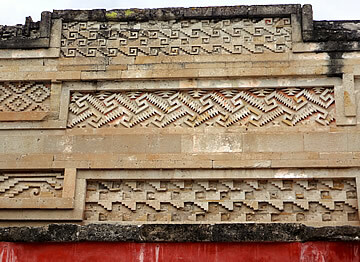 Inside the palace the walls are smothered with the geometric carving and there are substantial remnants of the red and yellow decorative pigments. 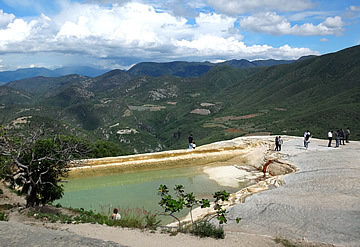 The Zapotec, as many ancient civilisations, believed that death was the gateway to a new life. 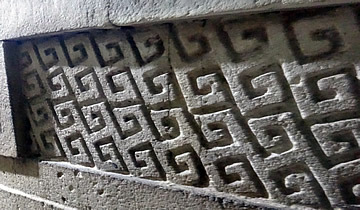 Our guide told us that the step decoration on the stonework symbolized birth and progress through life before death. 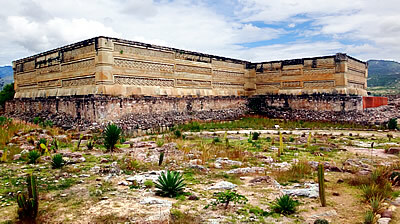 Interior courtyard of the palace. 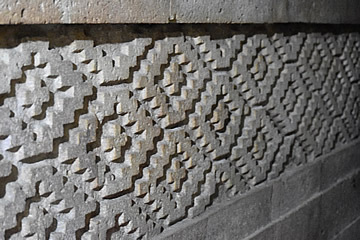 When you look carefully at the stonework you see that some are carved blocks while others are individual bricks shaped to fit into the patterns. 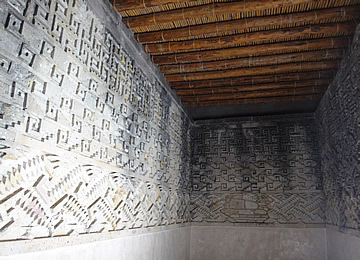 An interior room of the palace with reconstructed roof. According to Burgoa, the High Priest ruled from an inner chamber of the palace, seated on a throne covered in jaguar skin. 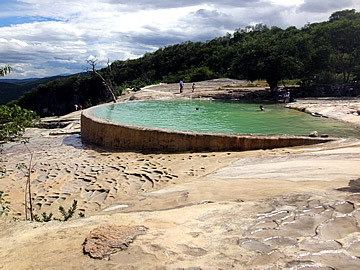 Burgoa describes the bloody sacrifices he believes were common at Mitla, and a great underground burial chamber for the Zapotec kings, nobles and warriors. 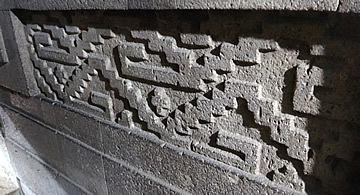 This burial chamber has not been discovered in modern times, though Burgoa describes how Spanish priests entered it and were so horrified they had it sealed. 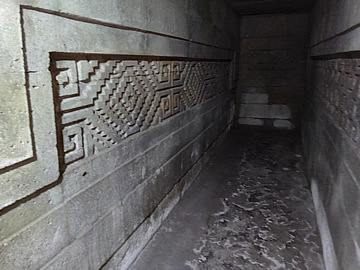 The south courtyard has more fabulous fretwork and two underground tombs that we were able to visit through very low doorways. 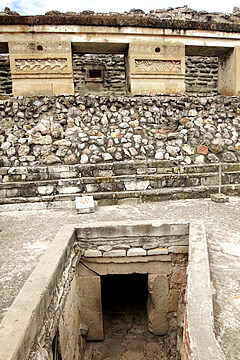 The entrances to the two tombs are in the surface of the courtyard, steps lead down, Tomb 1 on the left and Tomb 2 at the far side. 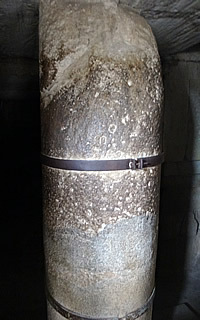 This column in Tomb 1 supported the roof at the intersection of the two arms of the cross-shaped tomb. 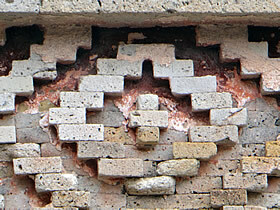 We couldn't see that any of the fretwork decoration had survived. 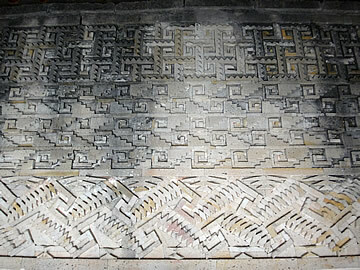 The tombs are in the shape of a cross and the walls were as lavishly decorated with stone fretwork as the walls of the major buildings outside. Funeral traditions of the time allowed for more than one burial in the same tomb, so earlier burials were simply moved to one side to make room for the new occupant. 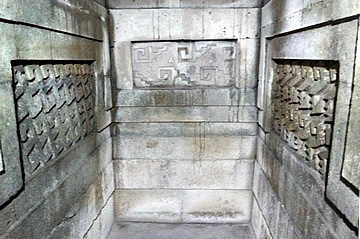 Though the fretwork decoration in Tomb 1 is no longer intact, in Tomb 2 it is still in extremely good condition. Lunch wasn't bad, a buffet but everything was bubbling hot. 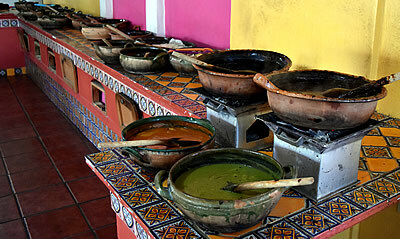 Freshly grilled meats and lots of spicy sauces as well as fried potatoes - most unusual. Finishing with churros. 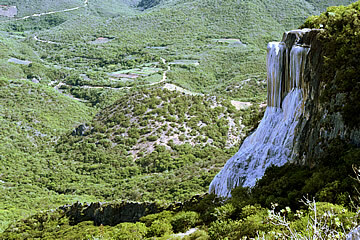 These natural rock formations east of Oaxaca are reached by a narrow unpaved road. 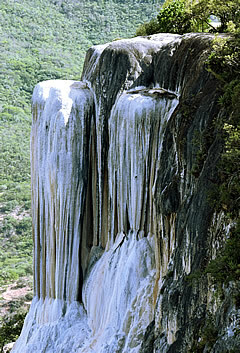 One of the formations looks like a spectacular waterfall. 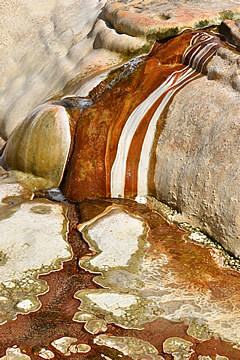 It is, in fact, a cascade of white calcium carbonate deposited by the fresh water springs which tumble over the cliff. 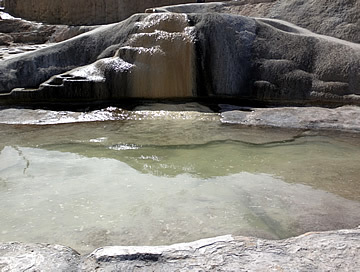 This "waterfall" can be seen from a shelf of white stone with pools, formed in a similar way. 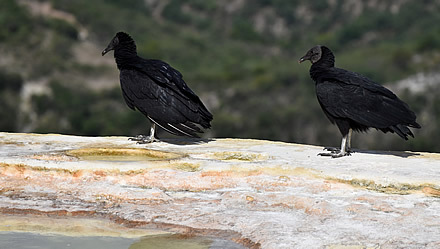 There was a photo shoot going on while we were there.